How Can I Tell if the Wiring is Wrong in My Breaker Box? You are here: Home » » For the Homeowner » How Can I Tell if the Wiring is Wrong in My Breaker Box? You need to upgrade part of your electrical system, and the electrician tells you that the job will be bigger than expected. Or your home inspector tells the wiring is wrong, but the seller says it works, and no one had a problem before. After one home inspection, a real estate agent called me up to ask about one of my findings. Her question was how was it that five other home inspectors in the last two years did not report this problem in the breaker panel (service entrance panel is the name used on reports), and you did. Is this really a problem. I replied that I could not say why this was not reported, but that it was a problem. She admitted that she knew that it was an issue, because her husband is an electrician. I felt that she might be implying that I was listing an issue for no reason, or that it might not be there (I did include a photo). There have been times when reading reports where I wonder if the home inspector was making something up. “The wiring could be better organized in the panel” was one statement that I questioned. I guess examining the panel would be the only way to understand that sentence. On a home inspection the other day, the buyer asked how did I know immediately that there was a problem, so I thought basic observations may help homeowners. The size of the wire is important. We may not think about the gage of a wire. They all convey electricity. Everything is working, so why would the wire gage matter? (Wire gage can be explained as the diameter of the wire or the wire thickness). Different wire gages are meant for different amperages. An improperly sized wire may work, but it can cause problems. An easy problem to imagine is overheating. A smaller wire is dealing with a higher amperage could overheat, causing a fire. If you are doing a visual inspection of the breaker box, you need to remove the interior panel. Before removing the panel, place the back of your hand along the breakers. If you feel heat, the breaker may have a problem. If there is a problem with the panel being energized, your hand will pull away when you use the back of the hand. Once the panel is off, how do you tell if the wire is the wrong size? Look at the amperage listed on the breaker, then look at the wire size. Without having a gage to measure the wires, look at the wire sizes. A lower amperage should have a smaller wire. Compare wires from different breakers to see if they look similar or different. In the photograph, you will see two larger wires coming from a breaker. The breaker is rated for 30amps, whereas these wires are probably meant for 60amps. Here comes the next problem: is the wire size wrong or is the breaker wrong? This cannot be determined by a quick visual here. You have to know what the maximum required amperage for that breaker should be. Is there a quick visual way to see if the breaker is the wrong amperage for the circuit? The optimum method is finding out what that breaker serves, then looking what amperage it uses. An air conditioning unit may use 60amps at start-up. If you have a 50amp breaker, the air conditioning may trip the breaker when the unit starts. Tripping breakers can be explained by incorrect amperage. There are other explanations though. The breaker can be bad. There could be a problem in the wiring. If breakers switches feel loose, and they will not flip back into position, the breaker can be the problem, but you may still have a wiring issue. If a breaker keeps tripping, then you should call a qualified electrician to examine the unit. What about wires and their organization? Thinking back to that statement in the opening paragraph, I may have an explanation for what that home inspector saw. Service panels can be messy places. You have many wires going out to circuits in the house, and the electrician may not have them pulled into the breaker box in a neat fashion. This may not be a huge issue, but neat work does help track down an issue. Sometimes you will see electric tape on the wires. This may be used by the electrician as an indicator as to the purpose of the wire. This may indicate a problem though. The sheathing on the wires helps protect the wire, but the sheathing also protects other items from the electricity in the wire. The sheathing should be in good shape. If you see nicks and cuts, there may be a problem with the wiring. I have seen where wire was improperly fished through a wall, damaging the sheathing This lead to shorts in that circuit. You will also want to look for scorch marks. This is an indicator of an electrical fire. Another problem can be double lugging. This is when two wires are in one breaker. The problem with this situation is that you have two circuits drawing power, which can lead to tripping. 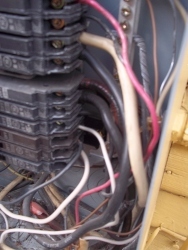 A disorganized wiring system in the box could be an indicator of poor workmanship in the wiring of the circuits. The last item to determine by a visual inspection is the power lines in the panel. Power lines are called the service entrance cables. Copper lines are great, but often aluminum lines are used. This is not a problem by itself. Aluminum wiring is not good in the house, but for the power lines, aluminum cables are fine. The one common problem with aluminum entrance cables is that they can rust, so they should have an anti-oxidant paste on them. This paste is often black, but it may be blue. What about loose breakers? With the panel back in place, you can check the seating of the breakers. However, let us stop for a moment before replacing the panel. What do the screws for the interior panel look like? You do not want a screw with a sharp point. The point could cut into the sheathing of a wire. All panel screws should be flat on their end. WI th the panel back in place, check to see if the breakers can wiggle. This is the big problem with FPE panels. The breakers have a tendency to come off, which can cause arcing. Arcing leads to fires. Do not attempt to move the breaker a great deal, because you do not want an arc. If the breaker feels as if it may be to loose, then you will want this checked. Is that really a problem? Before we leave our breaker box, I would like to mention AFCI breakers. This part of the home inspection bothers sellers, because we are reporting an item as deficient, when everything is working. There are a few similar items, but the lack of AFCI breakers is often something I am marking down on my report. AFCI means “arc fault circuit interrupter”. These breakers have “AFCI” marked on them, and they have a test button. Old versions of the GFCI system also used breakers to make a circuit GFCI compliant, so look at the label. Push the test button, and the breaker should trip. If the breaker does not trip, the AFCI protection is not working. Sparks (or arcs) from wires can cause fires, so having breakers that will shut off when they detect these arcs is a great safety measure. You do not put them on your house, but this is a new standard, and home inspectors will report on their presence. Another issue seen as a non-issue by many is labeling. I do not always know if a panel has the proper labels telling me what the breakers are intended to operate. However, a breaker box should have labels telling the owner what the breaker operates. For example, I was working on replacing plugs in a bedroom. I shut down the breaker, and I found the power was off to certain breakers, but not others. You would have thought that one breaker would be responsible for the power in one room, but I had to turn off two breakers. A label would have helped. I notice that most problems with the service panel stem from time. A house was built fifty years ago, and you want modern comforts. How about a workshop or sauna in the backyard? This adds more wiring, which has to be brought back into the panel or attached to an existing circuit. Fifty years ago we used less electricity, but now our homes have computers, gaming stations, and large media systems. Sometimes we try to have the work done cheaply, so we use older wires when putting in a new panel, or we use the wire at hand, which in either case could be the wrong size. I think we need to speak to our electricians to find out what is best, but you should have a basis for what they are discussing, which is the reason for this post. For example, yesterday a roofer came to my door. He told me that my year old covering was really old, nearing the end of its life. It needed to be replaced, but I should not worry about the cost; he works with the insurance companies. He tells them that there was hail damage. First, how does a new covering look that old from the ground? Next, how could I have obtained hail damage when we have had no rain? I know someone who feel for this line. They had the roofer replace their roof, then they discovered that they would have to pay the bill. Why? The insurance company said that the original roof was perfectly good, so why should they pay for a new one? If the electrician is telling you that you need extensive work with only a glance, be careful. Look over the panel yourself, then check out what they are saying. You may need work done, but understand what is happening. This entry was posted on Wednesday, October 26th, 2011 at 11:54 am	and is filed under For the Homeowner. You can follow any responses to this entry through the RSS 2.0 feed.